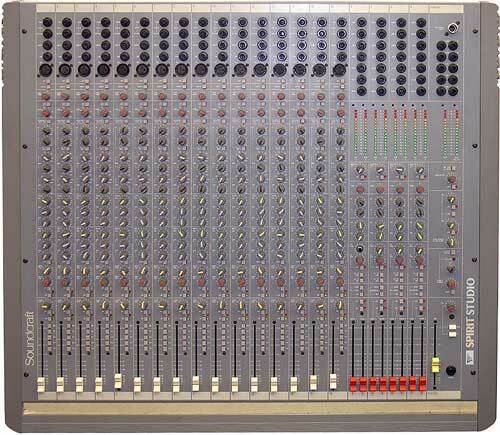 SECK 18-8-2 - The SECK 18-8-2, a cool fully featured space concious mixer ideal for a home-studio. Anyways it's a very cool mixer even if the eq is a tad harsh until you get used to it. 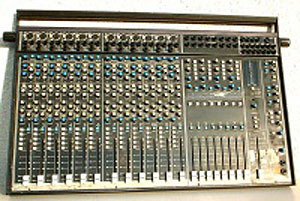 18 mic In's all with phantom (switchable on the stand-alone power supply unit), inserts on all channels & Busses, sweep mid eq on all channels, fully balanced throughout, 8 busses/subgroups, each of which is switchable between outs 1-8 & 9-16, so it allowed you to record a max 8 simultaneous tracks to your 16 track or all 8 tracks to your 8 track at once. Inline monitoring on all channels, 6 aux's (including the monitor section, master pots for all aux's, 4 aux returns, 2-track return, built in talk-mic switchable to 'slate' (tape) or to foldback - and lots more. Only downside is there is no MUTE button for chanels, you have to use the L/R IN/OUT button to mute channels or use the TAPE/CHANNEL switch. LED ladder meters for master & subgroups. It's a VERY compact mixer offering a hell of a lot of facilities in such a small size panel, and it's pretty robust, built into a steel anodised case with the channels set into 3 pcb boards (3 x6 channels) and the master section board all connected by ribbon cables. 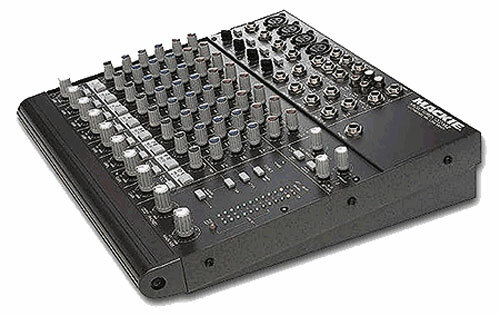 I've lugged this mixer all over the place, indoor and outdoor venues & raves, and it goes on and on. Once even i was in one squat and the roof leaked. I arrived back to find to my horror that water had been dripping into the mixer all day. I up-ended it and water POURED out!! - damn! - so I applied a blow-heater into the end with the end-cheek removed and left it on for a few hours to dry it out, and bugger me!... it worked again! and went on to work for years since that potentialy disasterous event! Anyone use this still? - Feel free to leave some user comments... a classic cheap mixer! Looking for a replacement power supply? Yes I still use a seck 18-8-2. I have owned this board for three years and had no problems at all. I just found an original seck meter bridge on ebay, It is an awesome addition to a great mixer. I use the seck as a live F.O.H console 2-3 times a month. the rest of the time it is used in my home studio. The double inputs are unheard of on new consoles and would cost 10 times as much. The mackie fader worked well for this. The guys from the music store were pissed when they saw me using this console. They said "I cant beleive how good that seck sounds" Ha. just goes to show, They dont make them like they used to! I own a SECK 18-8-2 but have no power supply. Can anyone tell me where or IF i can find a replacement? Anyone know where I can get the aluminium carrying handle/tilt bar? i've just bought a seck 18-8-2 today,it was olga's (of the toy dolls)his brother sold it to me ,hope he knows about it. I have an 18-8-2 seck power supply up for bid on ebay,email me and I,ll send you the auction page,will end in a day or so. With this desk I went through 1200 hours of studio work, and at the same time I love it for its features and hate for it's lack of reliability. Actually my console was made around '84, so the power supply has its caps replaced twice (the annoying hum is audible in headphones outs and makes also talkback unusable), all of the faders were replaced by myself (to cut costs, I've used cheaper ones than the original replacement parts - and it's alright so far). I'd like to have something with identical features... Or even tha same console but in better condition. Like someone else (above) I got this desk for nothing but no power supply. Wonder how good it sounds and where to get a power supply apart from stupid gbaudio.co.uk charging a fortune for them! I wonder why?? They also sell the 6 pin connector could I use that with a similar power supply? I ordered my 1882 in 1986. 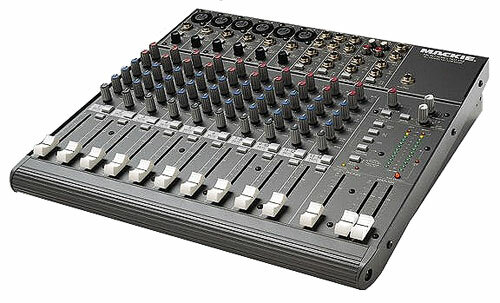 I've been using it for live sound, radio, video production and analogue recording. Now I use it connected to a Digi001 with Protools. The faders are worn, but the sound is still great. There can be some crosstalk on adjacent channels. It was a well made mixer. My original roadcase is battered ! I was just browsing on the internet and put the Seck console in search. I have the 18-8-2 and use it with my Digi 002 Rack in my homestudio in Iceland. I've had it for about 5 years and it works 100% and still looks like new. Great to hear that it's still in use by others. Had no idea how old it was. 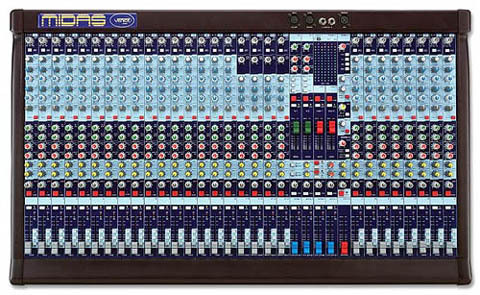 I'm Selling a Seck 18-8-2 Mixer With flight Case, Power Supply and User Manual plus two Terratec Phase 88 PCI sound cards with break out boxes and original packaging and manuals and all the leads to connect the whole lot up. All you need is a P.C and you have a fully functional 16 track work station ready to go. I had this set up in my studio for five years and I’ve recently upgraded the system so I’m letting the whole package go for £550.00. This is for collection only from the Mid Wales area so if you're interested please drop me an email. My Seck 1882 Mk2 has gone dead for sound. The VU meters are full up. Any ideas ? or where can I get a Circuit Diagram. i may sound like a massive idiot as it says something in the description, but ive bought one off ebay. can you use all 18 tracks on the 18:8:2 at the same time? Hello I sell as a table with two power supplies, one for the table and one for vumeter if anyone is interested in it please contact me, greetings and thanks. Accept offers, the product is in Spain and accept payment by pay pal absolute seriousness. give the sound desk, console vumeter + 2 power supplies send photos ok. I have a Seck 1882 but unfortunately the flat cables inside it are broken. Hopefully this is the only issue I'm going to deal with, but I'm having a difficult time sourcing the cable. Any help? well they must have used a commonly available connector i would have thought, cos it'd be nuts to have one designed and then pay for machining etc just to make a plastic multipin connector, it would cost way too much i'd have thought, so i expect you need to compare the connectors on the circuit-boards with various older connector types like old scsi ribbon cables. I own a Seck 1882 I bought in USA around 1990 for $3000. Built like a Tiger tank. Never had any problems with it but would like to sell. I'm strictly into home recording and don't see any use for this board now that I have a Roland VS2400CD DAW. Does anyone have an idea what these might sell for in the USA? 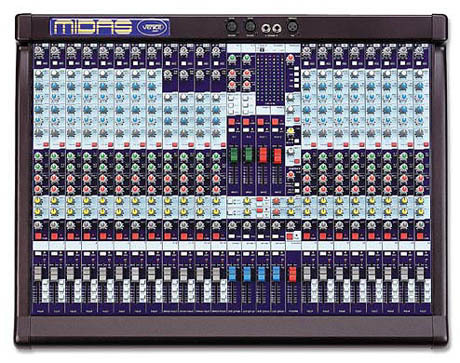 Perhaps I'm being foolish selling as this could be a good submixer down the road. if you are interested please email me and i can send you pictures. I have a Seck 18 8 2 that will be on ebay shortly unless someone on here wants to make me an offer? It all works but has two of the pushbutton covers missing. pushbutton still works fine, just no cover. Will be listing it early June. I've been trying to get the track outputs to work with my multitrack, but they just will not produce anything. Anyone got any ideas? Hi i have a seck 18-8-2 but have no power supply was wondering if anyone had one or new a cheapish place to get one please. I have a SECK 12-8-2. Once had a devastating cooking (literal smoking) of its op amps. I had to replace nearly 2 dozen of these low noise chips. Reason ?... and be warned - was the one tiny paper capacitor between the + & - power supply. THIS WAS SHORTED OUT!!!! Replacement cured the problem!! Power Supply also suffered once due to a shorted capacitor. Crowbar circuit prevents downstream damage byy blowing fuse. Another problem is the micro relays - Solos gone wonky - so have the monitor channels and channel crosstalk/balance. Have'nt had time to work on the console yet. Anybody has further comments pls advise. I'm looking for a power supply unit for my old SECK 1882 - lost the PSU at a show some years back. Anybody with one to sell? I just received a seck 6ch Mark II with a power supply unit wired for GB/Euro 220v. Is there a voltage select sitch in the board or is a different PSU required for 110v in detroit? You've probably worked it out by now but you need to connect your multitrack inputs to the channel inserts. Unless you're routing your channels to the 8 subgroups then you use the track outs eith 1-8 or 9-16. I have a Seck 18-8-2 with flight case and power supply that I paid £110-00 for back in 1999. Its worked perfectly since I bought it. I have what I guess is an orginal users manual ! Its actually a booklet of plain paper with set up instrucions and schematics. I also have a power supply schematic. The original power supply actually has the schematic on the top of its case!! If ever the supply goes down I would build a new one using the schematic and modern electronic components. I find using a mains filter inline before the boards power supply greatly reduces rattle and hum !!!!!!! I'd be happy to email schematics to anyone in desperate need of them (put SECK in the title then i know its not spam). Its a bloody good mixer and a lot of modern ones just don't do as good a job!! I love my 1882 but I'm confused on how to get the Track output's to work!! anybody got a clue please help!! Thank You!!! I have a Seck 1882 MKII desk for sale in absolutely mint condition, everything works fine, power supply included, I'm in London. Anyone interested send me an e-mail. condition, everything works fine, power supply included, Im in London. How much? and how are you contactable? I have a Seck 1882 MKII desk for sale. Everything works fine, power supply included comes in a high end flight case.